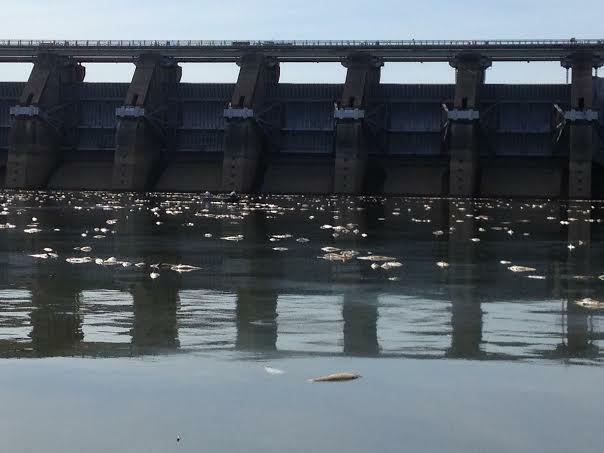 Remnants of the nearly 500,000 dead Asian carp floating below Barkley Dam. Scientists are studying the cause of a massive fish kill in western Kentucky, which state wildlife officials are saying is the largest kill of its kind recorded. “One group of gentlemen had just pulled in their limit of white bass,” Rister said. The impact on just Asian carp has biologists and a state aquaculture specialist flummoxed. Bob Durborow is an Aquaculture Specialist at Kentucky State University and has 30 years of experience, He says he hasn't seen anything of this magnitude before. Durborow is testing specimens he received on Thursday. Durborow thinks a lack of oxygen may be the cause of the fish kill but he’s investigating the possibility of parasites bacteria and viruses. But Kentucky Fisheries Director Ron Brooks disagrees. He says there’s always plenty of oxygen in the water this time of year. He also says the Barkley Dam wasn’t spilling water to create excess oxygen. He’s thinking there could be a virus or bacteria to blame. “There is a brain pathogen that has been found in Asian carp in previous smaller kills it is called Lactococcosis possibly it could be that and that is what we’re going to be looking for in more fish we got to the labs,” Brooks said. Durborow anticipates have all test results in a month’s time. 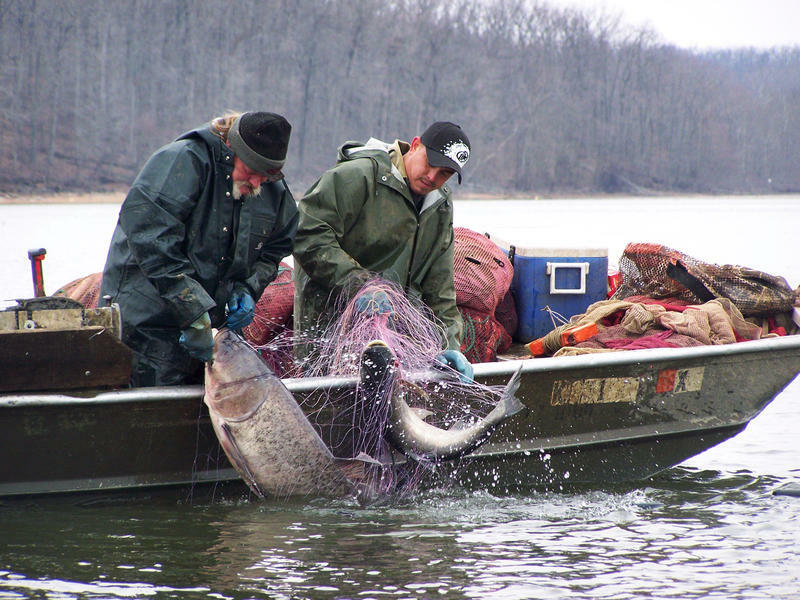 Asian Carp are invasive, fecund and troublesome to game fish. If scientists find the source of the kill then it could prove to be helpful to those battling the fish. “It’d be nice for them to be able to isolate that and create a biological bullet to combat Asian Carp,” Brooks said. But, that could spell trouble to some businesses that are trying to capitalize on the rapidly expanding Asian carp population. The invasive Asian carp has now been found in 12 states and in the Great Lakes watershed, gobbling up native fish, jumping aggressively into boats and reproducing like crazy. Researchers have tried various ways to slow the spread of the fish as it prowls other waterways. And, so far, efforts to introduce the big, bony fish to American diners haven't caught on. So now a processing plant in Kentucky is trying the latest method of Asian carp disposal: sending them to China. A bow hunting Asian carp tournament is coming in May to reduce the fish’s population, but a state official says it won’t have a significant effect. Fisherman James Story is coordinating the tournament in hopes of encouraging bow hunters to go after the carp. But Kentucky Fish and Wildlife Resources Fisheries Director Ron Brooks says there are just too many fish to make an impact in one day. During Sounds Good today, we met Paducah photographer Glenn Hall who has launched an Indiegogo Campaign to raise money to assist in night filming a documentary about the invasion of Asian carp in area waters, a project Hall's been working on since the floods of 2011. See more about the documentary on Indiegogo. An Asian carp processing plant opened today in Wickliffe. The Two Rivers Fishery plans to create 50 jobs, invest more than $2.5 million in the project and add to Kentucky exports. The plant will blast-freeze processed fish for shipment to South East Asia. The by-products of the invasive fish can also be used in fertilizer. The plant plans to process and sell up to 10,000 pounds of Asian carp per day.